IMAGE CLIP® Laser Digital Heat Transfer Paper produces self-weeding, vibrant and wash-durable laser printed transfers on white and light-colored cotton, cotton/poly blends and 100% poly fabrics. The product can be used to apply JUST the image (no background polymer)! 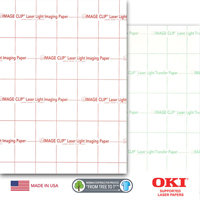 The product runs through a vast array of fuser oil and oil-less laser printers and copiers and is approved by OKI for use with their printers. This product is compatible with INDIGO 7000-1000 series of printers. The product is to be applied only with a commercial press. For transfer to all white and light-colored fabrics, mousepads, coasters, puzzles, leather, and other goods.